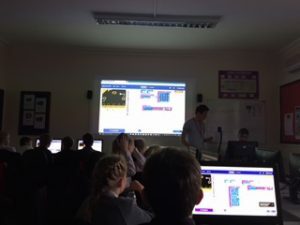 Year 5 and 6 have enjoyed a fantastic day of programming and app development using the micro:bit – a tiny programmable computer, designed to make learning about computer programming easy and fun. 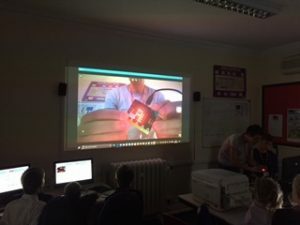 Ali Maggs, a specialist micro:bit trainer who is also well known for producing games and applications, spent the day at Grace Dieu teaching the children how to use the micro:bit and just how fascinating it can be. The pupils were challenged to programme their micro:bits to make a fitness tracker to count their steps and to show a message when they reached their step goal – which they really enjoyed! They also programmed the micro:bit to: show their names, to show a simple picture (made from 25 LEDs), to show a random number from 1-6 (like a dice), and to play a simple game. The micro:bit is well regarded for being more approachable and practical than just coding, with research showing that 90% of students say that using the micro:bit helped them to show that anyone can code. This was certainly the case at Grace Dieu – the pupils were incredibly engaged throughout the day – with many saying “it was the best day ever”!